The Lark Bunting was approved as the official state bird of Colorado by the Twenty-eighth Session of the General Assembly of the State of Colorado on April 29, 1931. The Lark Bunting, Calamospiza melanocorys, is a medium-sized sparrow.It is the only member of the genus Calamospiza (Bonaparte, 1838).. These birds have a large pale bill and a pale wing patch. Adult males in breeding plumage are black except for their white wing patch. Other birds are more sparrow-like in appearance; they have dark brown upperparts and white underparts, with streaking on the back, breast and flanks. The wings are dark with brown edges. Their breeding habitat is prairie regions in central Canada and the mid-western United States. The nest is an open cup on the ground in a grassy area. They forage on the ground, mainly eating insects in summer and seeds in winter; they sometimes take short flights in pursuit of insects. Outside of the nesting season, they often feed in flocks. These birds nest in dispersed colonies. Males fly up over their territory and sing while descending to declare ownership of a nesting territory. The song consists of a mix of whistles and trills. The call is a soft hoo. This bird's numbers have decreased with the loss of natural prairie habitat. This article is licensed under the GNU Free Documentation License. 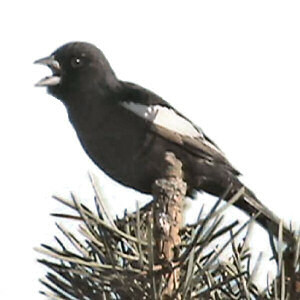 It uses material from the Wikipedia article "Lark Bunting". The following information is excerpted from the Colorado Revised Statutes , Title 24, Article 80, Part 9, Section 24-80-910. STATE HISTORY, ARCHIVES, AND EMBLEMS. The lark bunting, scientifically known as Calamospiza melancorys Stejneger, is hereby made and declared to be the state bird of the state of Colorado. Source: L. 31: p. 735, § 1. CSA: C. 152, § 10. CRS 53: § 131-8-10. C.R.S. 1963: § 131-8-10. Male and Female Lark Bunting: Painting from www.50birds.com. Birds of Colorado Field Guide: by Stan Tekiela.